The iTOVI scanner is a great way to start a wellness conversation with your friends and family. It uses electrical frequencies to see which doTERRA oils and supplements your body responds to, and provides you with a personalized report. It’s an amazing experience! 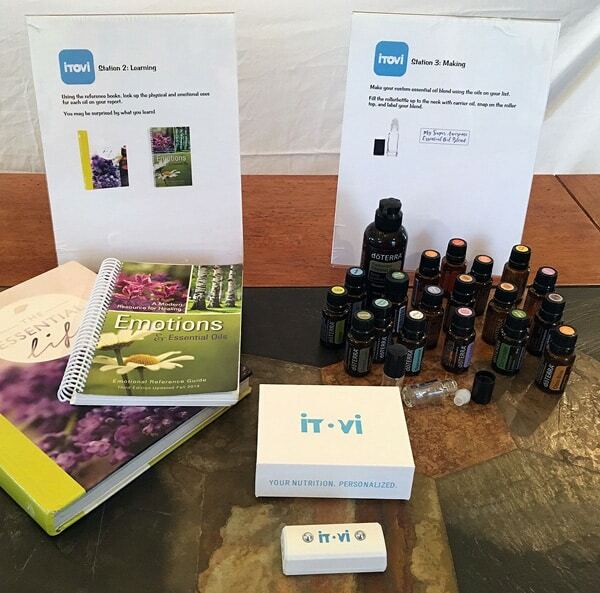 At a doTERRA iTOVI make and take class, you provide the iTOVI scanner, essential oils, and rollerbottles. Your guests will make their own custom essential oil blend based on the wellness results from their scan. This is a easy way to introduce your friends and customers to the physical and emotional benefits of many different oils. There are four easy steps to teaching this class: invite, get supplies, set up, and teach. Decide how many people you’d like to attend. Anywhere from 6-10 people is ideal, depending on the space available and how much time your guests have. Allow 10 minutes for each person to be scanned and make their custom oil blend. There’s no such thing as a perfect day of the week or the perfect time to teach a class. Choose a day and time that’s convenient for you and your guests, and start inviting! Invite twice as many people as you’d like to have at your class. A personal call or text is much better than hoping they’ll see an email or Facebook invite. It’s best to invite everyone to come to the class for free. However, it makes sense to recoup your costs for the oils and supplies used for each person’s custom blend. You can charge a flat fee per person, or you could charge each person separately based on the cost of each oil they use. I prefer to charge a flat fee—it’s easier for me and my guests to remember. 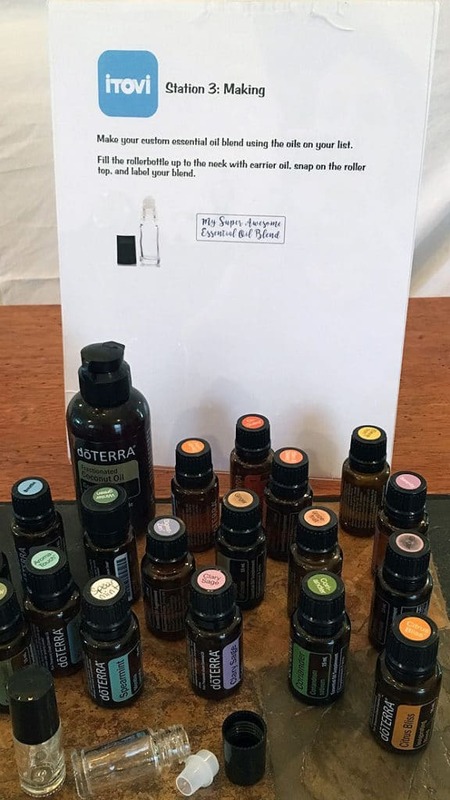 When calculating this fee, be sure to include your cost for the rollerbottles, fractionated coconut oil, and an average cost-per-drop for the essential oils (about $0.18 per drop). 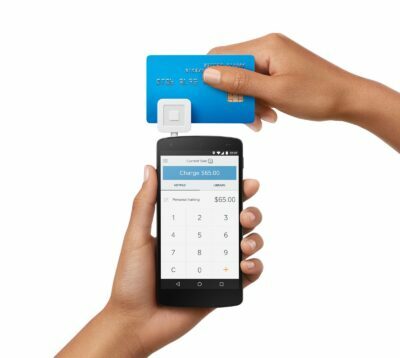 Square reader so guests can pay with debit and credit cards. Use my link to get $1,000 in free processing. Set up the room with “stations” so everybody can see how the class will flow and what happens where. At this class, you’ll have a Scanning Station, a Learning Station, and a Making Station. Your Scanning Station will be slightly apart from the other stations, so the person being scanned won’t be bumped or distracted. 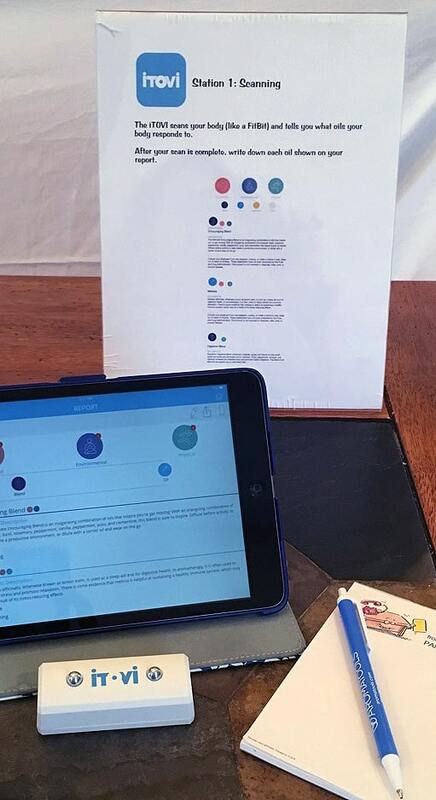 Put the Scanning Station sign in an acrylic holder and put the iTOVI, alcohol wipes, a notepad and pen, and your phone or iPad on the table. Ensure that the iTOVI is charged. I also change the settings to scan for 5 oils per person (not supplements or kits). The Learning Station is where people can research the oils that were recommended from their scan. Put the Learning Station sign in an acrylic holder and set out a copy of The Essential Life or Modern Essentials. 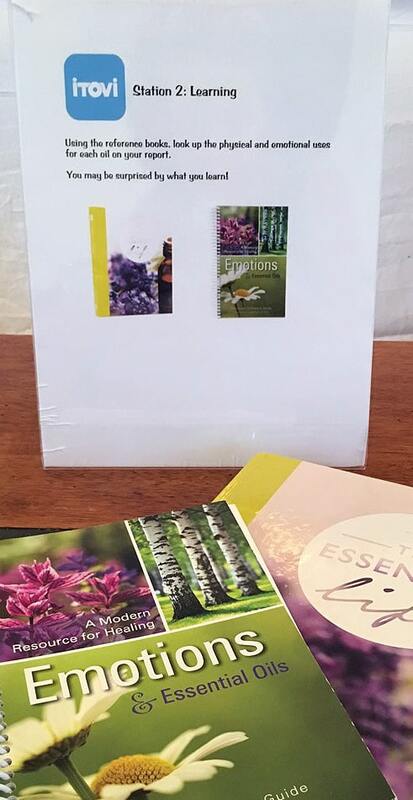 I like to include a copy of Emotions & Essential Oils as well. At the Making Station, guests will make a custom essential oil blend from the oils recommended in their scan. Put the Making Station sign in an acrylic holder and set out the rollerbottles and labels, essential oils, fractionated coconut oil, and pipettes. Welcome everyone and thank them for coming. If your guests are new to essential oils, give them a quick introduction to essential oils and doTERRA. 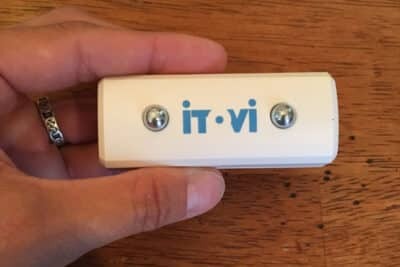 Show everyone the iTOVI scanner and explain how it works. 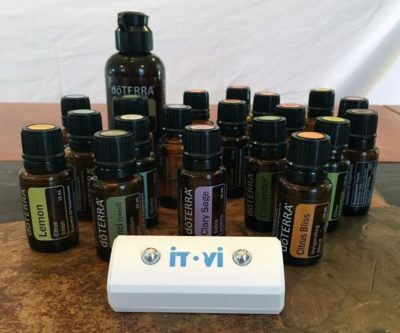 This is a good time to remind everyone that the iTOVI is not a diagnostic tool, but shows us the doTERRA products our bodies have a strong response to. Point out the three stations and explain what is at each one. Everyone begins at the scanning station, and those who are waiting for a scan can look at the reference books or experience the oils while they wait. As each guest comes to the Scanning Station, clean the iTOVI using an alcohol wipe while they enter their contact information into the iTOVI system. Then place the scanner in their hand and begin the scan. I leave them alone for a few minutes so they can watch the video that plays during the scan. Their results will automatically be emailed to them, but they should also jot down the oils that were recommended. They’ll take this information to the Learning Station, where they can research the physical and emotional uses for those oils. This can be an illuminating experience, especially if they look at the emotions behind the oils! 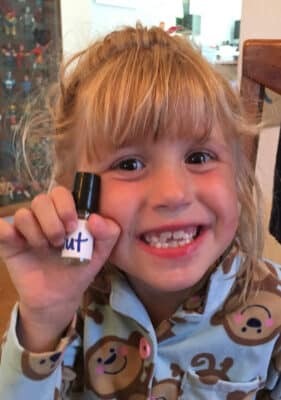 After they’re done at the Learning Station, they’ll make their custom essential oil blend based on the oils from their iTOVI report. There are a few different ways to determine how many drops of oils should go into each custom blend—this is my favorite method. Each person’s scan report will have 5 different oils or blends listed, from strongest response to lowest response. They’ll use 10 drops of the first oil listed, 8 drops of the second oil, 6 drops of the third, 4 drops of the fourth, and 2 drops of the fifth oil listed. This will fill about half of the rollerbottle, and then they fill it the rest of the way with fractionated coconut oil. Then they can snap the roller onto the bottle and label their blend. They’ll use this blend twice a day—I prefer rolling it on the soles of the feet. Followup is critical for a make and take class. One or two days after the class, connect with everyone who attended either by phone or text. Thank them for coming and see how they’re doing with their custom blend. If they have any questions about the oils in their blend, this is a great opportunity to set up a one-on-one appointment and discuss which oils will meet their family’s health needs. 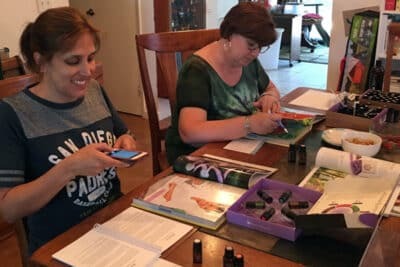 Congratulations on hosting a successful doTERRA iTOVI make and take class! Thanks so much for this great info! Can you tell me what you generally charge for the scan? I have no idea what range would be appropriate! Thank you! Thanks do much for this info. I have heard of iTovi, but did not know what it was. Very informative. Hi, Can you recommend an iTovi Scanner practitioner in the NYC or NJ.area that I can consult to make a custom blend for myself?